That's right, my gear-head friends, eat your hearts out. 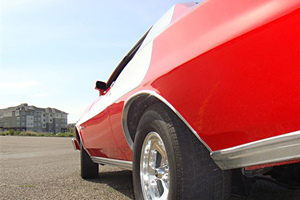 This car has its original Q-Code Cobra Jet 351 Cleveland engine with 4 barrel carb and C6 transmission in it. Tony found the car in Vulcan, Alberta in 2006 and worked on restoring it from the ground up (see more photos on next page) until September of 2008. The day after he got it out of the shop, he entered it in a car show and won Best Ford! 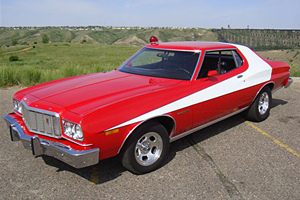 This Gran Torino Sport with bucket seats and center console is "just what I wanted, but would need some TLC" Tony says. 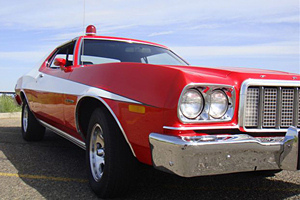 The fact the car was also a "Q" code unit was "an added bonus." Tony says just finding it was "like pulling hen's teeth. There were lots of Torinos out there but most were too far gone to restore. This one had minimal rust to the lower fenders, doors, and quarters as usual. However, all the pillars, floor, and even the inner wheel wells were solid. The car had a vinyl roof (see more photos on next page) which had weathered and rusted the metal roof underneath. On the interior, the seats and trim panels were trashed but that was not a problem as they would be redone anyway for the restoration." 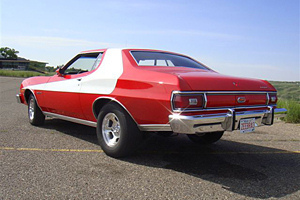 Tony says, "The fellow I bought the car from is a well-known local and had already rebuilt the 351 Cleveland 4 bbl Cobra Jet engine and C6 Automatic Transmission. After purchasing the car, I took it to Brian my mechanic at Harold's Auto Service and had him go through the entire car and replace any seals, bearings, brakes, check the engine, put in an electronic ignition, replace the carb, all the shocks, and all possible suspension bushings, etc. Then I stripped the unit completely. 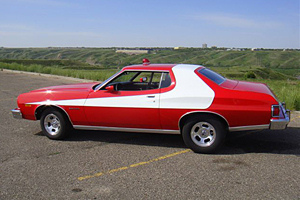 I had planned to do the bodywork myself but my job kept getting in the way, so I talked with Bill at Bridge City Chrysler in Lethbridge and had him complete the restoration. All rust was removed and the panels were rebuilt with metal back to original condition. The job was done to perfection and the refinish is excellent. This is as close to a frame-off as it can be without actually being a frame-off because that was not necessary." 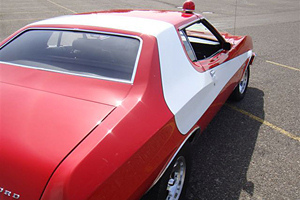 Tony decided to go with the movie car's "Viper Red" color and straight white toner for the stripe. 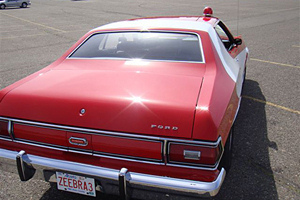 The interior was replaced, including an aftermarket headliner, door panels, and carpet, and the seats were restored in black by Terry at Quality Upholstery in Lethbridge. 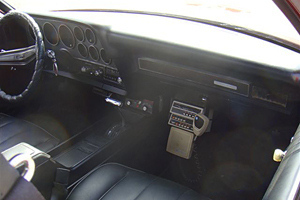 Tony rebuilt the center console and refurbished the dash himself. The wheels were replaced with American Racing rims until Tony can find a set of vintage mags at a reasonable price. All four wheels are 15" with lower-profile front tires and air shocks in the rear to add to the rake. The bumpers and bumper guards were rechromed, the wheel opening lip moldings are all refurbished, and the door seals, belt moldings etc. are all new. 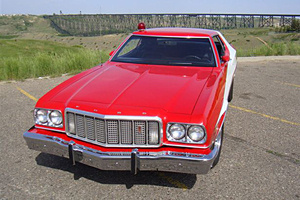 Tony decided to leave off all indications of the Sport trim on the doors and the Sport emblems and opted for a TV show and movie replica mix, including a Police radio, siren, light. "Everything is restored" Tony says, "and the unit is like a new car to drive - it drives and runs great." Tony says, "I used to wander the car lots in Edmonton, Alberta and see the factory S&H units for sale and dream. 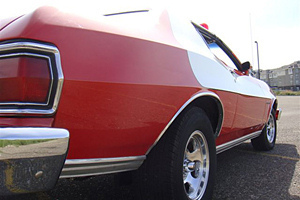 Now, 34 years later, I finally have a S&H Torino!" Congratulations, Tony, and thanks for sharing! Created November 14, 2008. All Rights Reserved. Photos are the Property of the Car's Owner.